Embrace Every S-curve, Off-ramp and Straightaway. When the road calls, the 2019 MX-5 soft top answers. And there’s no feeling like it – top down, wind-in-your-hair exhilaration. 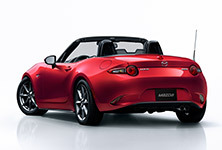 The MX-5 is the world’s best-selling roadster for a reason. Now in its fourth generation, the 2019 MX-5 comes with a new trim level, a more powerful engine and a new available brown roof. But it’s the way the MX-5 takes to the road that will keep you coming back for just one more drive, one more minute on the road. Commits to the asphalt with smooth and quick agility. Designed to evoke the feeling of spontaneous power. With an obsessive attention to detail, Mazda engineers have yielded a near perfect 50/50 front-to-rear weight distribution. With its carefully balanced symmetrical design, the MX-5 connects you with the road like never before. 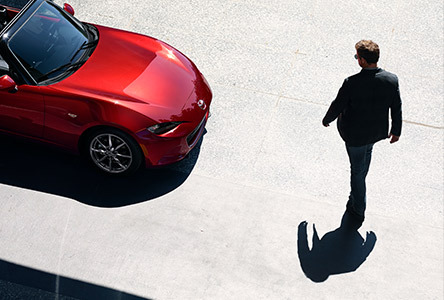 For 2019, Mazda engineers have meticulously enhanced the MX-5's range of horsepower and torque with improvements to fuel intake, combustion and exhaust system, as well as drivetrain. The result is that you get more power when you need it – or want it. Engine may not be exactly as shown. At the heart of every Mazda lies a faithful adherence to KODO design, and the MX-5 is no exception. From the shape of its headlight to the leather trimming of its bucket seats, every last detail of the MX-5 is crafted to look, act and feel as though the vehicle is an extension of its driver. Even in a convertible sports car, safety should never take second place. The MX-5 comes with more standard and available cutting-edge i-ACTIVSENSE‡‡ safety features to give you added confidence on the road. So you can relax and enjoy the drive ahead. 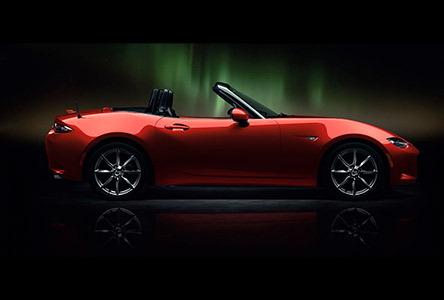 Customize your MX-5 with optional Dark Cherry roof or Brown‡‡‡ colour. With a lightweight soft top aided by an integrated assist spring mechanism, quickly and easily control your roof from the comfort of your driver’s seat. 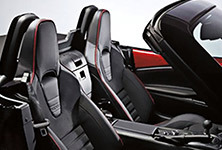 The MX-5 GT model offers available Chroma Brown Nappa leather-trimmed seats. These beautiful, premium leather seats◆ conform to your every curve for improved comfort and maximum enjoyment on the road. Evolving from our original Soul Red paint, Soul Red Crystal Metallic yields an emotionally charged energy and vividness, and takes clear depth and lustre to a much higher level. The available Sport Package on the GS-P model with manual transmission includes BBS® wheels and Brembo® front brakes, Recaro® sport seats with Nappa leather and luxurious Alcantara®-trimmed upholstery. Easily control the functions on your MAZDA CONNECT infotainment system using the HMI Commander. All right at your fingertips, and viewable on your full-colour 7” touchscreen display. Now standard on all models. Crank it up to your heart’s content and your ears’ delight. With Bose® sound‡ on your side and 9 speakers surrounding you, you’ll never want to listen to music anywhere else. Every seat is now the best seat in the house. The MX-5’s signature heated‡ seats, available in cloth or leather-trimmed†† upholstery, conform to your every curve for reduced vibration and improved comfort. Now with more standard i-ACTIVSENSE features than ever, you’ll get where you’re going safely. Standard features include: Advanced Blind Spot Monitoring, Rear Cross Traffic Alert, Smart City Brake Support, Lane Departure Warning System and High Beam Control System. Plus, GT models offer a Traffic Sign Recognition System***. †Estimated fuel economy on the Mazda MX-5 with automatic transmission. Estimated fuel economy based on Government of Canada’s approved, revised 5-cycle testing method. Your actual fuel consumption may vary depending on how, where and when you drive. For comparison purposes only. 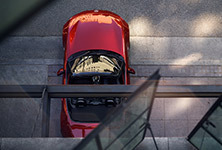 For more information on revised 5-cycle testing, visit mazda.ca/5cycle. ‡‡‡Dark Cherry roof is only available on GT models with black leather-trimmed upholstery, and optional Snowflake White Pearl, Jet Black Mica or Machine Grey Metallic exterior colours. Brown roof is only available on GT models with black leather-trimmed upholstery with Soul Red Crystal Metallic or Machine Grey exterior colours, or with sport tan leather with Snowflake White Pearl or Jet Black Mica exterior colours. Not available with Nappa Leather. ‡Standard on the GS-P and GT models. ††Standard on the GT model. ◆Optional on the GT model. ***TSR functionality may not be compatible with all regional road signs in Canada. 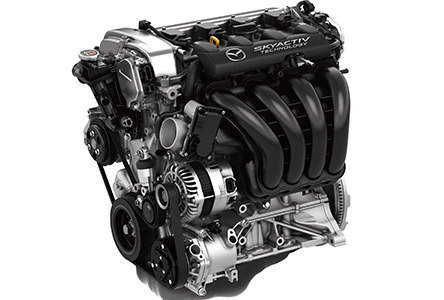 *MAZDA UNLIMITED refers only to an unlimited mileage warranty program under the terms of which there are no mileage limitations on the following specific Mazda warranties: (i) 3-year new vehicle; (ii) 3-year roadside assistance; (iii) 5-year powertrain; and (iv) 7-year anti-perforation. 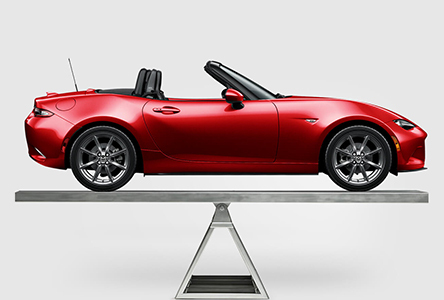 All Mazda warranties remain subject to the terms, limitations and restrictions available at mazdaunlimited.ca. **Offered pricing for the 2019 MX-5 GS (L2SK69AA00)/MX-5 GS-P (L2PK69AA00)/MX-5 GT (L2TK69AA00) is $32,900/$36,900/$39,900. Pricing based on Manufacturer's Suggested Retail Price (MSRP). Pricing subject to change without notice. See dealer for details. Offer excludes freight, P.D.E. and fees. Offer excludes PST/GST/HST. ® BBS is a registered trademark of BBS GmbH. ® Brembo is a registered trademark of Brembo S.p.A.
® RECARO is a registered trademark of RECARO Holding GmbH. ® Alcantara is a registered trademark of Alcantara S.p.A.